Wow, after such an epic last post, it's hard to come back with something else exciting. Thanks so much everyone for you comments about my magnets, I'm so glad you found it helpful. I'll get straight to today's nail stuff. 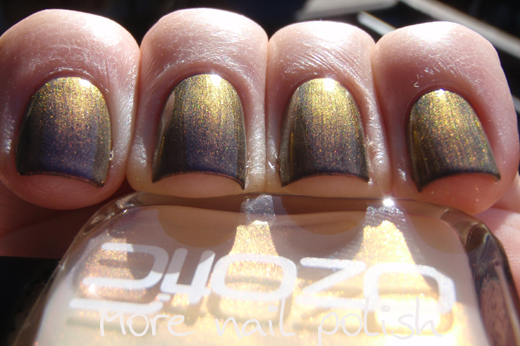 Today I have another of the Ozotic duochromes from the 700 series. 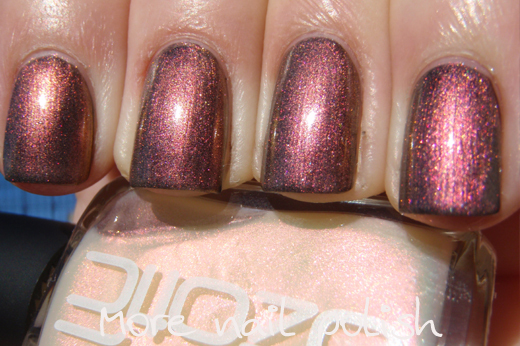 This is another duochrome that really changes depending whether you layer it over white or black. 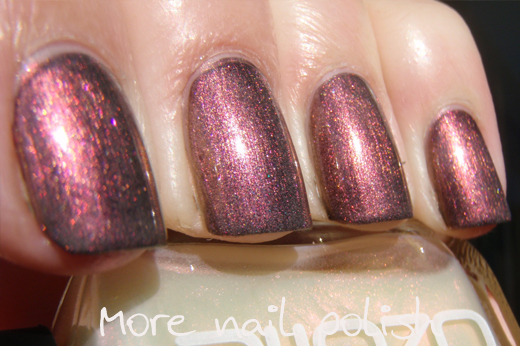 In the bottle it looks like an iridescent pink polish, with a slightly milky shimmer to it. 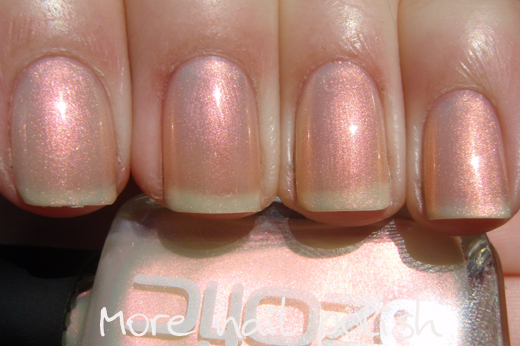 The shimmer in this shifts from pink to orange/gold. This is two coats over a white base. Over white, it's harder to see the gold shift, but it's there. This polish is very sheer on it's own. This is two coats and as you can see, you can see right through to my little white nail tips. I feel a little naked just wearing this on it's own. I'm not really used to wearing such sheet polishes. Finally, here it is over black. It really transforms from a light summery polish into more of an Autumn/Winter polish, which is great because it means you can wear it all year round. 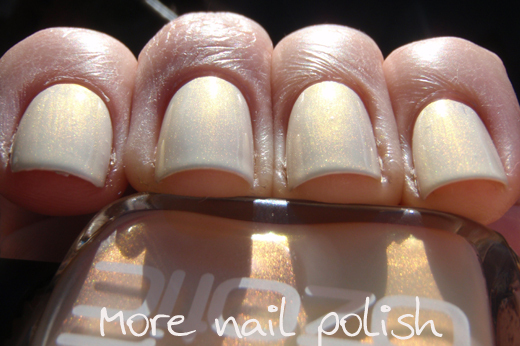 As usual with Ozotic polishes, the formula on this was just perfect. Even though it has a very shimmery finish, it applies very smoothly and not streaky or frosty. 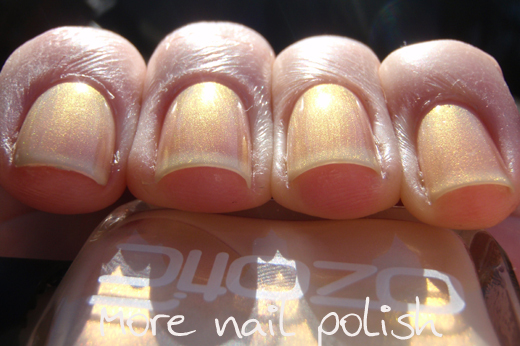 Pretty color, but honestly , the more i see the ozotic 700 serie . 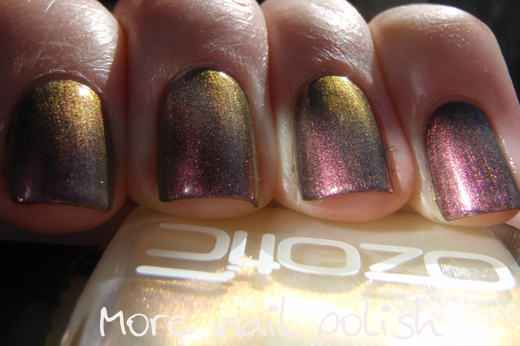 I insist that they have nothing to do with ozotic 500 serie duochrome. I seem more muted colors, with less effect. Well, it's just my opinion. Yes, you're right about that. The 500 ones are definitely mulit-chromes, where as the 700 series are certainly only duo-chromes. Not the same finish or effect, but still pretty in their own right. soooo pretty I'm really loving these layered over white, it makes me think I need to reconsider pale colours! I was doing a small order from Trans Design recently and got CG White on White in that order on remembering your posts of Ozotics layered over white! I'm a little late to the party, but this is beautiful! I'm not normally one for white polish but layered over the white base looks so sureal... Its also very cool over black.